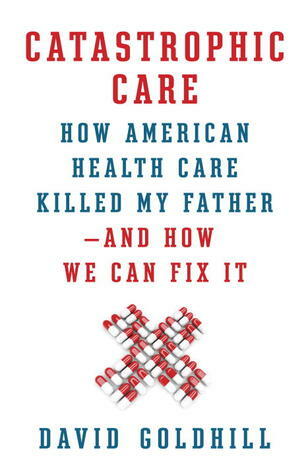 I just finished reading David Goldhill’s excellent book Catastrophic Care: How American Health Care Killed My Father — and How We Can Fix It. I don’t say this often, but EVERYONE must read this book. MUST. It’s important to note that Goldhill is a Democrat and a liberal, as he states in the book. He wants everyone to have access to health care, at reasonable prices for them. But even he is clear that the American health care system as it has evolved over the past 40 years or so is broken and that having our government step in and use the current messed-up system to provide more care is not a viable solution. Indeed, the costs of this bloated, convoluted system are already at levels that can’t possibly be sustained, and as time goes on, the whole system will hit a critical level at which it can no longer function, and no one will receive adequate care. There are a lot of problems going on. One is that we’re already getting poor care from the system; hundreds of thousands of Americans die every year from medical errors. Most of us have cause to complain about our insurance or health care (which are not synonymous but which are essentially tied together in a sick, symbiotic beast), but we feel helpless to DO anything about it. Goldhill writes that the problem there is that we as patients are simply not the consumers/customers of the business of health care: the insurance providers are. The system itself has pushed us out of the loop so we feel we can’t demand better care or prices. Goldhill makes his case very clearly and simply and walks readers through how we got where we are today; read my review of the book for more information, but then read the whole book to really get the idea. That background of health care/insurance’s history then allows us to understand why the government “fixes” are just going to make the problems even bigger and worse. By the end, Goldhill even comes up with his own plans for making health care available and affordable to everyone in this country, even for rare and costly illnesses. I can’t emphasize enough that we as consumers and patients and citizens of this country need to get better informed and then act to change the situation. Only if we all urge our political leaders to make an overhaul — and then prepare ourselves to take more responsibility on ourselves as consumers — will the system change and be something that will give us better care, prices, and customer service. Unfortunately, it may well take a terrible catastrophe or crisis (not too far off in the future) before we decide to act. I only wish we could act before that happens. I’ve been wondering if there was a good book out about our health care system. Thanks.